I would love to visit an Outback restaurant and get me a nice juicy steak one day. I've never been. If you have been to an Outback, how was the service and the food? This is the treat I want right now! What's your favorite dish at Outback? Here's your chance to visit again or gift a visit to share in the Outback experience! I love the Bloomin Onion. Right now I really like the steak and Crab Legs. The only bad part, not enough crab legs!! I like their Towering Grilled Shrimp on the Barbie Filet. I like their PARMESAN-HERB CRUSTED CHICKEN. Of course we love their Bloomin' Onions! And I also love their Alice Springs chicken! I like the Alice Springs Chicken. We always order a blooming onion. My favorite dish at Outback is the Bloomin' Burger with sweet potato fries. Bloomin Onion is my favorite! The Blooming Onions are my favorite dish. The bloomin onion is my favorite! For sure the bloomin onion!!! Wow, I haven't been to Outback in years! We used to love their Victoria steak and the mushrooms. It's got to be the Bloomin Onion, the trick is to eat it fast while it's very hot. Outback's center cut sirloin is great! I love the Bloomin Onion and Crab Legs. Yummy! I love the baby back ribs and blooming onion. I love the blooming onion. I love to get a ribeye steak, mmmmm! I love the Alice Springs Chicken!!!! 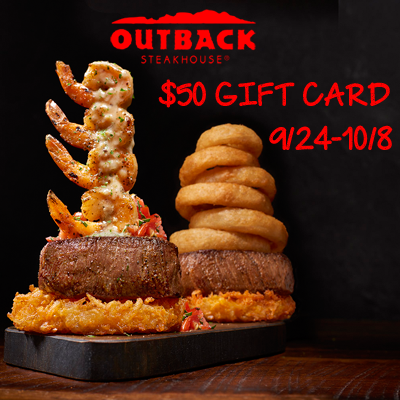 I have never been to Outback, do I look forward to discovering them with this gift card.